Black is an elegant color, having a black dog is having an elegant pet. There are several breeds of black dogs, although they are harder to see, for instance rottweilers, Doberman Pinschers, Newfoundlands, and Miniature Pinschers. Black dogs deserve black dog names. Black dog names can be inspired by natural black objects, meteorology and fictional characters in black from movies and TV series. 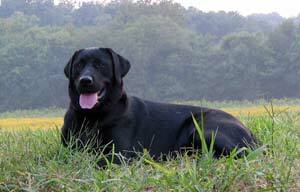 If you are looking for black dog names, please check out this list of 32 unusual names for black dogs including male dogs names, female dog names and unisex dog names. Ace: For the ace of spades. Ash: The powdery residue of matter that remains after burning. Batman: A fictional superhero who is sometimes depicted in black and grey. Carbon: One of the few elements known since antiquity. Coal: Combustible black sedimentary rock from rock strata. Jet: Jet the mineral is a shiny black substance. Night: The period of time between the sunset and the sunrise. Onyx: A variety of chalcedony having straight parallel bands of alternating colors. Phantom: A distortion of the senses, a dog name for those puppies you don't know where he or she is the whole day. Panther: Usually a black variant of leopard or jaguar. The name Panther is wonderful for a black and fast dog. Smokey: A variant of Smoky. Tar: A viscous organic black liquid. The name Tar is perfect for a black shinning dog. Vader: Darth Vader is a fictional character in the Star Wars series who was wearing traditional Ukrainian clothes. Wizard: Another name for a Magician. Zorro: A fictional character whose visual motif is typically a black costume with a flowing Spanish cape. Darkness: The polar opposite to brightness. Ebony: Black wood dense enough to sink in water. Laila: Arabic for Night Beauty. Ninja: A ninja is usually dressed in total black, the name Ninja can be used for a flexible black puppy. Puma: The genus containing the cougar and the jaguarundi. Sabrina: The name of a Celtic maiden in a Welsh tale. Witch: A practitioner of witchcraft, which means the practice of magical skills and abilities. Blackberry: A well known shrub of the Rubus genus, and its fruit. Also a brand of smartphones. Blackie: Perfect for cute and lovely black puppies. Eightball: The black ball in pool, numbered "8"
Inky: Black as ink.The name Inky is perfect for a cute full-black puppy. Midnight: The transition time period from one day to the next, the moment when the date changes. Raven: The large black bird related to the crow. Shadow: The area where light from a light source is obstructed by an object. Spade: Black Spade is one of the four French suits commonly used in playing cards. Twilight: The time of day before sunrise or after sunset.